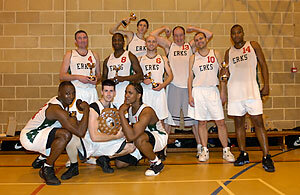 Erks - EMBL and Play Off Champions 2007. 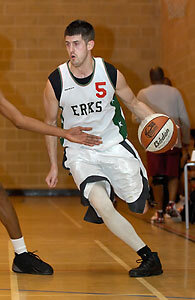 Coach McCusker looks to inbound the ball. 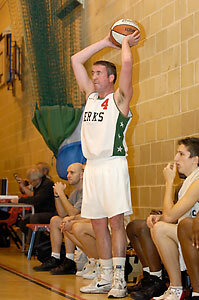 Mark Denchfield scored 24 points that included four treys. 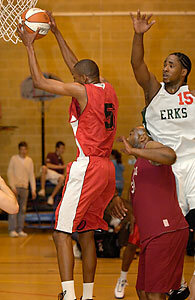 Erks' Craig Pringle rises above Cardinals' Marvin Willson (#8) and Calvin Gooden (#10). 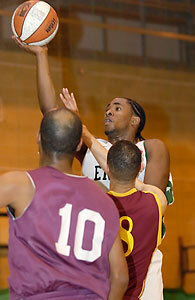 Top scorer with 29 points, Cardinals' Searle (#5) grabs a rebound from Craig Pringle (#15). 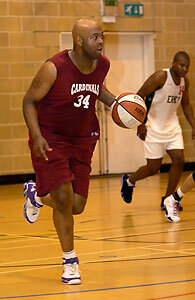 Cardinals' Tony Peltier proved to be a big presence in the paint. 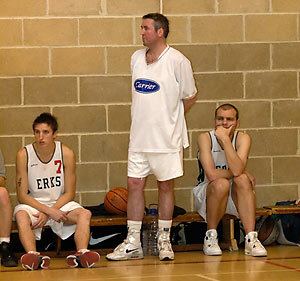 Erks fans enjoy a joke at courtside. 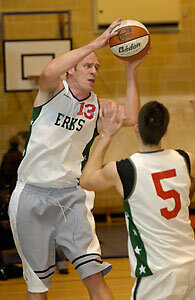 Dave Churches grabs another rebound. Coach McCusker (standing) is flanked by Robin French (#7) and Lee Atkinson. 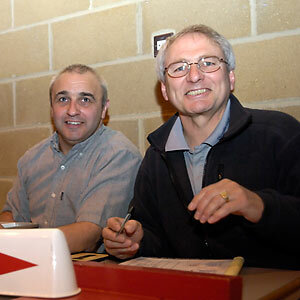 Outgoing EMBL Chairman Brian Pittman (on right) and Mr K. Bates were the table officials. Cardinals return to court after a timeout. 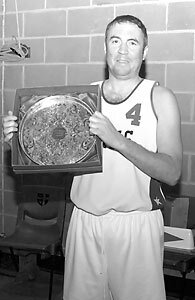 Brian Pittman's last game as EMBL Chairman was an entertaining and competitive affair with old rivals Erkenwald facing Cardinals in the EMBL Play off final on May 17th at Sydney Russell. With a small crowd at courtside that included Lakers, Stars and Tigers representatives, it was Cardinals that started the game in a more lively manner and immediately their fast break produced some early points. However, although Cardinals appeared to dominate the early action, two Mark Denchfield treys kept the Erks in touch and by the end of the first quarter, Cardinals only had a two point advantage. 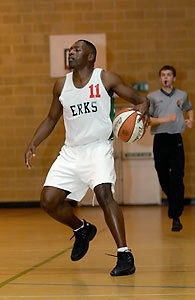 Erks started the second quarter much better with both Denchfield and Keith Pringle doing the damage with 7 and 8 points respectively. By half time the Erks had outscored Cardinals 20 - 10 and it appeared that the Erks had finally broken Cardinals. Especially as their energetic running game looked to have seriously run out of steam. The half time break allowed the Cardinals to recover; particularly Cardinals' K. Searle who started the third quarter with a 7 - 0 run that brought the scores back to 36 - 33. Seemingly inspired by Searle's efforts, other Cardinals stepped up their intensity and, by the sixth minute, the game was level again. Craig Pringle offered the most resistance to the onslaught with 7 points however Searle's 13 points was the highlight of the period that ended with a 52 - 49 score in favour of Erks. Into the fourth period and it could have been very close. However, Coach McCusker asked his team for one last effort and they delivered with a 14 - 0 run that effectively killed off the game. Such was Erks' dominance that Cardinals first score of the final period was in the 5th minute and, although they did rally on the back of three treys, Erkenwald finally secured the win with a final score of 81 - 68. Cardinals' K. Searle's ended the game with a dunk and his total of 29 points was impressive however proved to be insufficient to prevent the Erks, with four players (Denchfield, Keith Pringle, Craig Pringle and L. Daley) scoring in double figures, from the win. 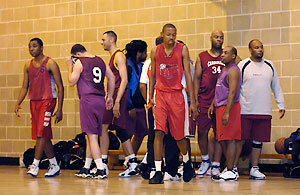 For three quarters Cardinals looked dangerous and meant that Coach McCusker had to stay with a big line up and thus wasn't able to use outside players like Robin French, Lee Atkinson and Gareth Sims as much as normal. After the final whistle, Brian Pittman presented both teams with their League and Play Off medals and trophies. 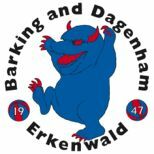 All in all a very satisfying end to this season's Erks campaign although it only really kicked off in March when they played 7 games with a 6 - 1 record. The only team that caused problems for Erks was Gintaras who, fortunately for Erks, were eliminated by Cardinals in their abandoned Play Off semi final.